In December I ran 142.39 miles compared to 104.65 in November. December was the month where I ran the most miles. Plus, according to my cool spreadsheet, I finally ran over 1,000 miles this year. I signed up again for the Runner’s World Holiday Running Streak. I wasn’t able to complete it last summer nor last winter but three times is a charm right? I did it…but barely. How hard can it be to run one mile per day? Ha, it was definitely more work for me. Or maybe I was just lazy? During the week the last thing I wanted to do was go to the gym for that mile. Yeah, I guess I could have ran outside but this crazy weather was not helpful. Well, with all complaints aside, I completed this streak and that is all that matters. Total miles ran in 2013 was 1018.59 miles compared to 848.41 in 2012. This year I ran 24 races. 14 of those races were Rock ‘n’ Roll Half Marathon Races. I PR’d in the ING Hartford Half Marathon and at the Community Bank of Elmhurst 4 on the 4th. 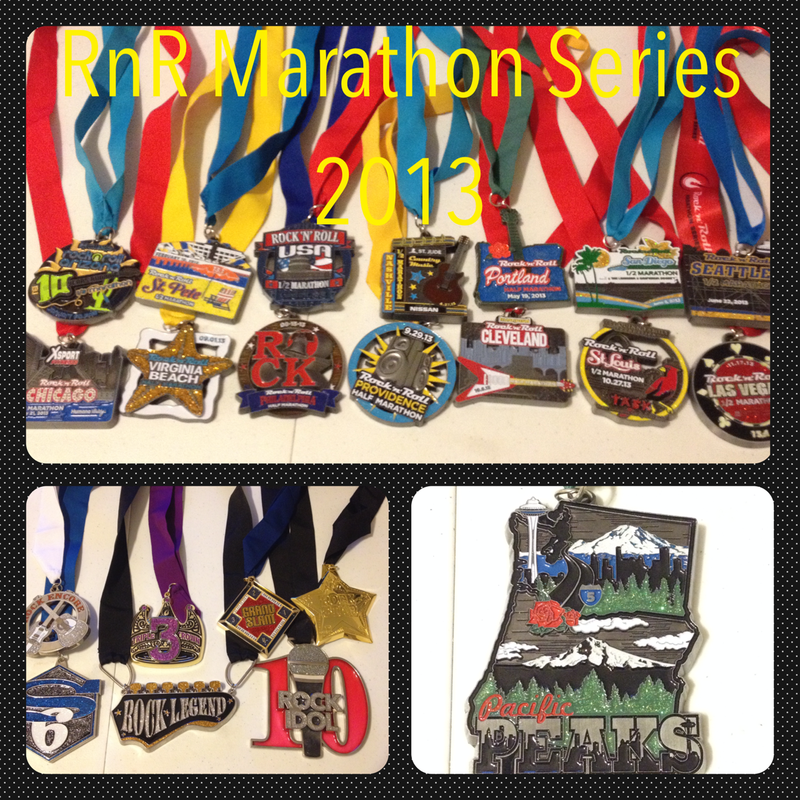 My best race experiences were the ING Hartford Half Marathon and the Rock ‘n’ Roll Las Vegas Half Marathon. Other cool races were the Little Rock Half Marathon because I met Bart Yasso and the Manchester City Half Marathon because I met the lovely Kathrine Switzer. Best medals I received were from the Mississippi Blues Half Marathon and the Little Rock Half Marathon. I would love to go back to Little Rock to run the full marathon because the medal is as big as my face. I ran in 19 states last year. 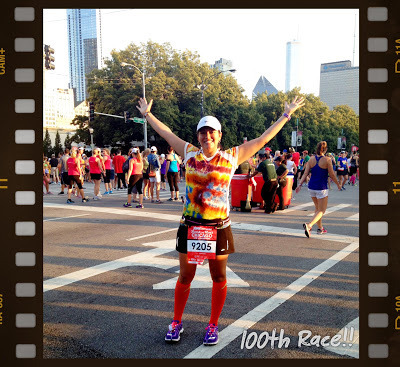 Also, I ran my 100th race in my sweet town Chicago! I submitted this photo to Pavement Runner as one of The Best Photos of 2013 and he posted it on his blog! There are other amazing photos so make sure to check it out. I ran in the Mizuno Wave Elixir but fell deeply in love with the Brooks PureFlow 2 and the PureConnect 2. I love them so much that I’ve purchased several pairs from Running Warehouse. Are 8 pairs enough? I discovered Huma Energy Gels but also found out about Gu Energy Gel in Salted Caramel thanks to Kim at (Just) Trying is for Little Girls. Run with Jess had 12 Days of Christmas Giveaways and I won Day 12 which was an 8pk of Gu Energy Gels in Salted Caramel. Yep, that made me very happy. 2013 was a frustrating year for me. I could not even get close to a sub 2 half marathon (which was my goal in 2013) but I was also frustrated for being hard on myself and not being able to fully experience and enjoy each race. However, after various pep talks from several people and a big change of attitude, I was no longer frustrated and instead made the best of each race. I loved traveling to each state and look forward to many more this year. Follow my journey as I travel to run in more states, each RunDisney Half Marathon, and a 50K all in 2014. Thanks. And yes you have to try that flavor. The salted caramel is even better on a cold run, love that stuff! ING Hartford is definitely on the top of my list for 2013 too. So great to meet you pre race (and know that you got a PR, I’m good luck, right?) Could the weather have been any better? Looking forward to following along with you in 2014–I hope we can start together again this year! You were my good luck charm! And the weather was just amazing, perfect running weather.